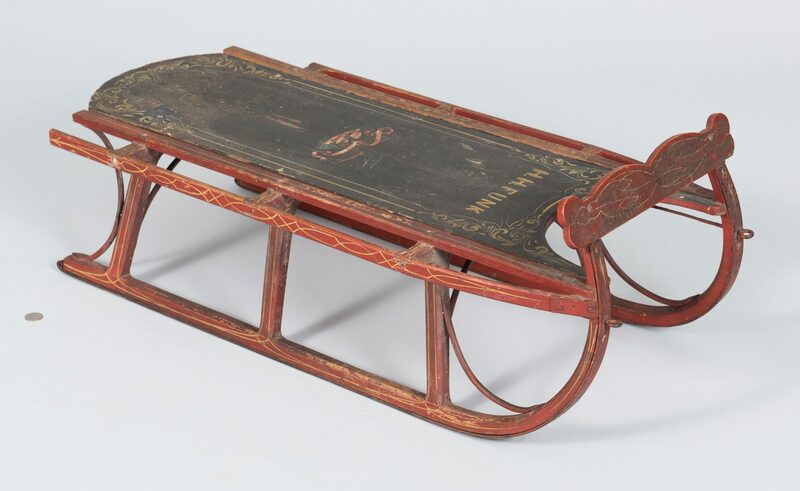 1st item: Painted decorated child's snow sled, black painted top with multiple stencils including H. H. FUNK to the top, American Eagle with banner and flag shield to the center, and scrolling foliate design to the bottom. Red painted and stenciled base with iron runners to the bottom. 35 1/2" L x 16 1/2" W. Late 19th century. 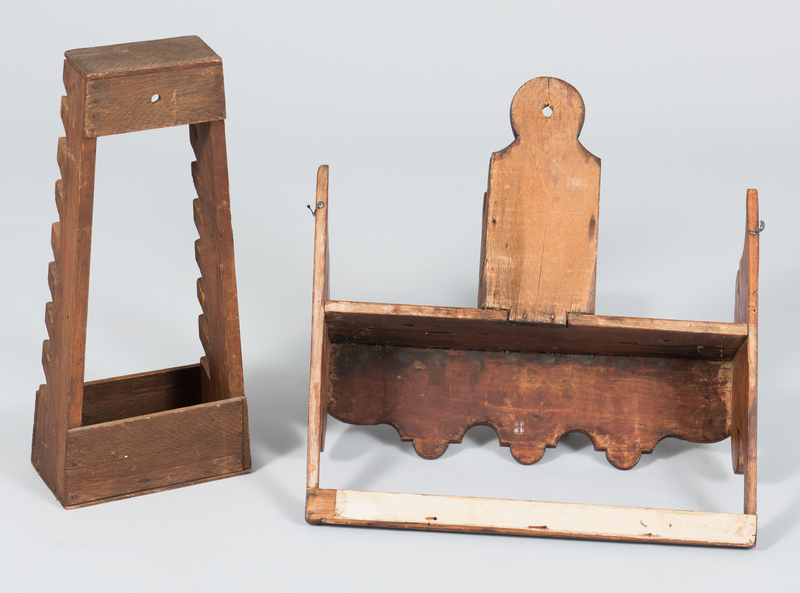 2nd item: Folk art pine and mixed woods wall shelf having shaped front, notches for spoons and/or other utensils to the top, a lower display rack and an open piggin box for candles mounted to the top, remnants of old paint. 22 1`/4" H x 20" W x 6 3/4" D. 19th century. 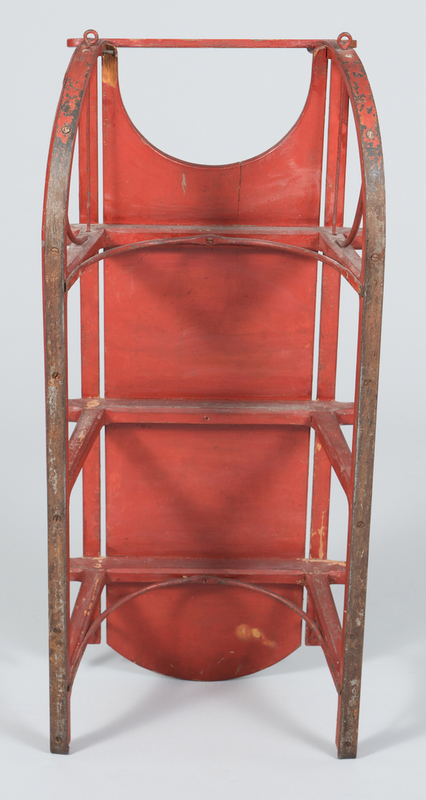 3rd item: Folk art hanging display rack with box, possibly for pipes, comprised of mixed woods. 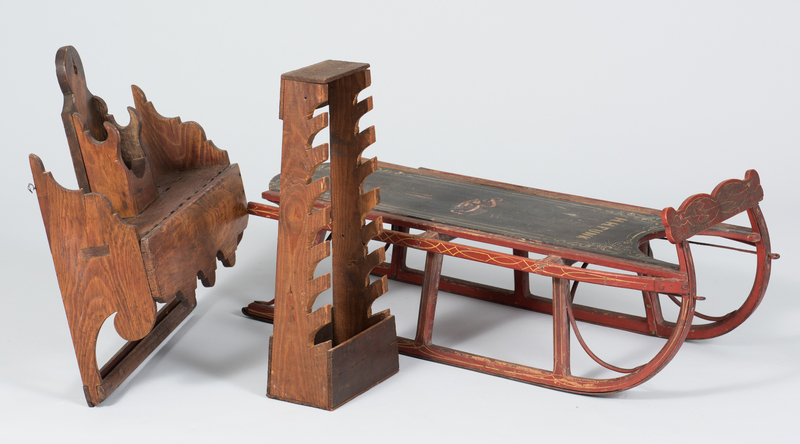 21 3/4" x 9 1/2" W x 5" D. Late 19th century. Estate of J.D. and Jane Vandercook, Hendersonville, TN. CONDITION: 1st item: Wear and losses to paint, especially to top. No visible breaks or repairs. 2nd item: Refinished, general wear and losses to wood. 3rd item: General wear from use, overall good condition.